When The Entire Crew Grooved To 'Dhoom Dhadaka' On The Sets Of Namaste England! 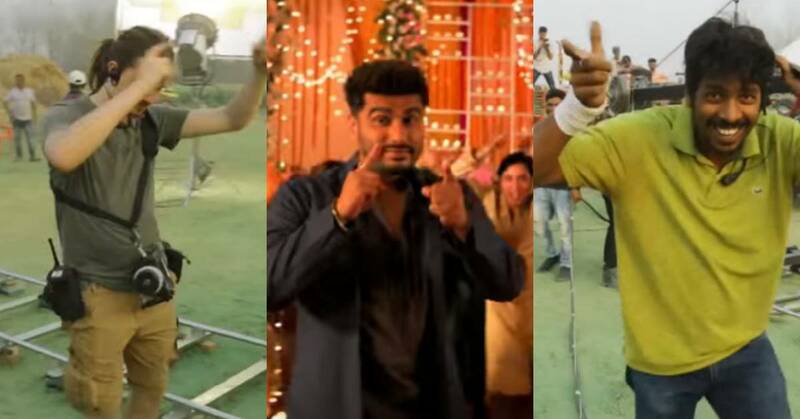 Arjun Kapoor took to social media to share a BTS video of Namaste England's 'Dhoom Dhadaka' showcasing the entire crew of the film grooving to the catchy 'Tim Lak Lak' from the song. The video talks about the "Tim Lak Lak" hook step of the song. The Choreographer of the song Ganesh Acharya says "That's a sign movement, Koi bhi kar sakta hai, Easy instant". The video features various people, crew members doing the "Tim Lak Lak" hook step showing how easy and catchy it is! Earlier, the music of the film took over the masses with a romantic number 'Tere Liye', party track 'Bhare Bazaar' and now the recently released Punjabi song'Dhoom Dhadaka' has taken over the audience. Vipul Amrutlal Shah’s 'Namaste England’ is a young and refreshing story that traces the journey of two individuals Jasmeet and Param. It tracks their love story across the landscapes of India and Europe. It’s a fun quintessential Bollywood film starring Arjun Kapoor and Parineeti Chopra. Produced and directed by Vipul Amrutlal Shah, the film is presented by Pen Movies and Reliance Entertainment in association with Blockbuster Movie Entertainers. ‘Namaste England' is scheduled to hit the theatres on the 19th October, 2018.